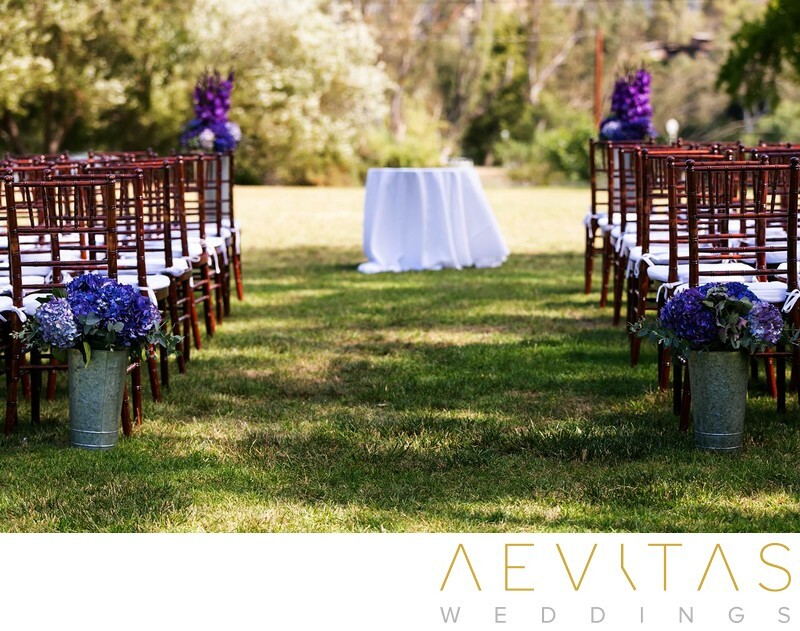 Nestled into the stunning Santa Monica Mountains, the Malibou Lake Mountain Club provides an idyllic natural setting for your dream wedding day. With sweeping lawns and rustic features, the private club has a distinctly neutral tone, enabling you to decorate it in your own, distinct style or theme. But in addition to creative flexibility, the crowning feature of this wedding venue is magnificent Lake Malibou itself, where burning sunsets and watery reflections provide an unforgettable backdrop to wedding photos. Ceremonies are held on its lush green lawns, with shade provided by sprawling trees. The views across the lake are stunningly serene and you can personalize your ceremony with a floral arch or flower-petalled runway. While the outdoor lawns of the Malibou Lake Mountain Club cater for up to 400 guests, the interior can only seat 200, and the venue lends itself better to more intimate wedding gatherings. After the ceremony, capture family formals and bridal party photos as your guests mingle on the lawns with a glass of champagne. Then head down to the lake’s waters for the sunset “golden hour”, with moored boats and tree-lined walkways providing whimsical feature elements in your couple portrait shoot. The Malibou Lake Mountain Club holds its receptions inside the spacious clubhouse, where a warming fireplace and impressive bay windows create an inviting atmosphere. With whitewashed gray walls, you really can transform this space into your wildest wedding day dreams and select a theme that reflects your individual personalities. There is an outdoor deck where your guests can step outside to enjoy the fresh night air, or use it to capture romantic nighttime portraits of you and your loved one, set beneath the twinkling Christmas lights. Catering is provided by Truly Yours who will handle not only the cooking and serving, but also the table placings and linen. Their menus are customizable, so you can create a dining experience to suit your own tastes, and you have the option to BYO beverages if you don’t want to go with their selection. For couples wanting a natural escape wedding setting, whilst still being within only an hour of Los Angeles, the Malibou Lake Mountain Club is picture perfect.